Jet Airways Boeing 737 MAX 8. Confirming the challenging nature of the market, Jet Airways posted a loss of ₹1,036 crores for the fourth quarter of the fiscal year ending March 31, 2018. This pulled the full year loss to ₹767 crores. This was their first loss after eleven consecutive profitable quarters and the first full year loss after 2 years of profit. The results reflect the intensely competitive revenue pressures along with also growing input costs. The airline as of now has a negative net worth and the auditors have noted that that revenue and cost measures including the ability to raise funds are critical to the company. Debt levels continue to be high and the onslaught of the low fare carriers only grows stronger. Jet Airways will have to find a way to navigate through this severe turbulence. With continuous capacity addition, the Indian aviation market is witnessing intense fare pressure and numerous fare sales. In such a market, the cost base is critical to success and this is where Jet Airways is most disadvantaged. Its cost per available seat kilometre (CASK) was up by four per cent for the quarter and 2.5% for the year. This cost base just cannot hold up as LCCs with their low cost base can yet turn a profit while forcing Jet Airways to match fares making them unable to cover costs. As an example, comparing Jet to the market leader Indigo, Jet’s cost per available seat kilometre was ₹1.33 higher. On a Mumbai – Delhi flight for flying 170 seats each way, Indigo’s cost would be approximately ₹214,000 lower per flight or ₹1,259 lower per seat. Assuming a normal 86% passenger load factor, Indigo could sell a seat on the same route at a price lower by ₹1469 compared to Jet Airways and still recover the cost of their flight. The international segment continues to be Jet’s revenue earner. However even this segment was impacted by several market trends. The average ticket fare for Jet Airways across the network was ₹13,800 roundtrip per passenger for the quarter and ₹14,000 for the year. Given that 55% of Jet’s revenue comes from international operations, these figures are far too low to cover the costs of operation. Key reasons for these low fares were weakness in the Middle East market (traditionally a strong revenue source) witnessing significant yield declines due to general weakness in their economies, and additional capacity from LCCs. Additionally, the premium passengers gravitated towards foreign carriers which offered a superior product on wide-body aircraft (Jet primarily uses narrow-body 737s on middle-eastern routes) and better connections. Jet has made a wise decision to finally remove its ultra-heavy first class suites from its 777-300ER fleet thereby increasing the number of seats and revenue opportunities. The resulting weight reduction will also improve range of the aircraft and operating economics and complexities. While fuel and maintenance are largely out of the control of the airline, items such as selling and distribution should be addressed. At ₹2,828 crores, cost of sales and distribution takes out 11 paise out of every rupee Jet earns. Similarly, interest costs of ₹859 crores for the year point to the fact that Jet Airways will have to either get an equity infusion and/or recast their debt. The one bright spot for the quarter and the year is that Jet Airways’ frequent flyer program continues to grow and help retain a corporate traveller base. As of the end of the year it had eight million members up 30% compared to last year. The program continues to be a favorite amongst corporate travellers and helps Jet Airways command higher premiums. In the domestic market it is being challenged by Vistara, though in a limited fashion given Vistara’s small network. 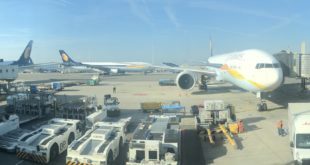 This program will be critical to success going forward and indeed Jet Airways has started to leverage analytics to further gain revenue advantages from it. Jet Airways announced the return of former CEO Nikos Kardasis as an advisor to the board. The year also saw several management changes with Vinay Dube joining as CEO in August this year; the return of Raj Sivakumar as Senior VP Network Planning and Revenue Management and the extremely short tenure of Capt. Ed Davidson as Senior Vice President Operations who was brought in from Qatar. Most of the talent is expat management which seems to be the industry norm (Read our analysis on foreign talent here). Jet flew a mixed fleet of 737s, 777s, A330s and ATRs for the year. In April 2018, it entered an agreement to purchase an additional 75 737 MAX aircraft to the existing 75 737 MAX ordered. Apart from helping Jet with vastly improved operating economics, it will aid in fleet and hard cabin product modernisation. The longer range of the MAX is expected to open new destinations for Jet, especially when one takes into account Jet’s focus on making Bengaluru airport its third hub. 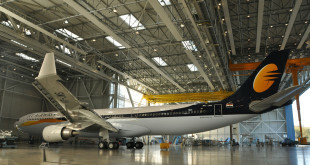 Jet Airways will take delivery of its first 737 MAX 8 in about one month from now. The wide-bodies too at some point will have to be phased out to arrive at a single widebody fleet type (Airbus or Boeing) as an effort towards cost reduction. The airline has the Boeing 787-9 on order which will fit the bill, but has been deferring deliveries till now. Jet Airways’ ATR fleet which continues to be perplexing. Market sources indicate that evaluations have been underway on whether to remove the fleet, contract it to a third party, or to refresh the fleet. However, with Jet Airways’ bidding on subsidised flights under the government’s UDAN scheme, it appears the airline would like to continue for the time being. A reduced sales tax on smaller aircraft in this age of rising fuel costs also helps. The ATR fleet is a double edged sword as it enables Jet Airways to compete with the likes of SpiceJet and Indigo but also carries with it complexity and costs both of which have to be attached towards achieving a lower cost. The future of their ATR fleet remains uncertain. Going forward, it seems that Jet Airways is headed for a turbulent ride. Debt will grow for the short-term. The revenue pressures are intense and the cost base is high. Addressing both these elements is critical to success. As usual, we invite your comments sharing your thoughts, views, and analysis.